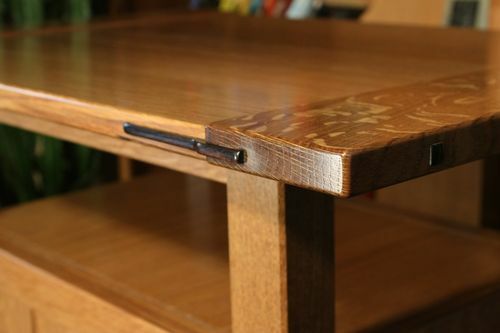 I had some requests for a few more of these type of tables so off to work I went…. I made a previous version that can be seen in my projects page, these tables have a few changes but otherwise are identical. 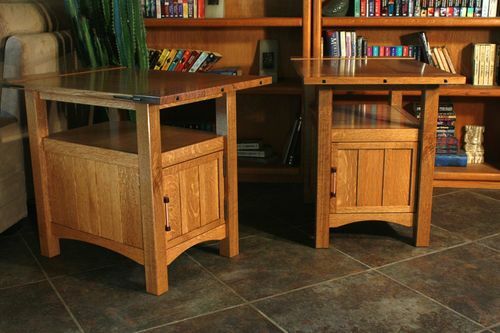 What makes these tables “chair side” in my opinion is they are tall enough (24”) to place the top even with the top of a typical chair arm and the shelf allows for a place to stash magazines. Overall dimensions are 24”h x 22”l x 16”w. with hidden wood expansion gaps for the inevitable dimensional changes with humidity. The top is my basic rendition of the G&G breadboard end and splines. I used the William Ng style jig and 1/4” straight router bit to cut the slots and my own version of his jig for shaping the splines. Not wanting to spend the money for the Ng fingernail bit with a top bearing (since I already have one without the bearing). I just removed the bearing and collar from a 1/2” shaft flush trim bit and placed it on my fingernail bit. Problem solved! The finish is Mohawk Matte precat lacquer. I really like this stuff, sprays really well and is cheaper than poly while providing a hard surface. Q&C welcome, thanks for looking! Beautiful result and great work. G&G is one of my favorite styles and these are an excellent representation of it. WOW! These are BEAUTIFUL, and I don’t even have a caps lock on my iPad. Amazing design and craftsmanship. Floored I am. Just really great! Like everyone else has said. Spectacular, awesome, beautiful, gorgeous, and yes even nice looking!! These are fantastic. 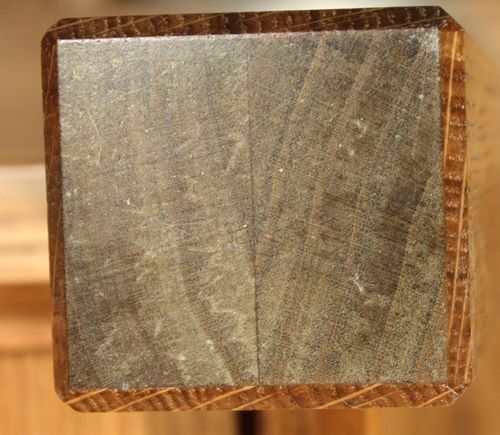 Did you use ebony for the splines and plugs or a substitute? Jamsomito, I used Gaboon ebony but imagine sone day I’ll have to try dyed maple or other substitute when I run out. just gorgeous,i love the g&g touches one of my favorite styles.nice job on how you wrapped the legs to maintain the grain.great job. WOW! These are BEAUTIFUL, and I don’t even have a caps lock on my iPad. Splint, these are very tasty and the execution is exceptional. Where did you get that great looking qswo in NM? Wow – thanks for sharing all the background and details (like that wrapped leg…need to store that in mind for a future project perhaps!). Great looking tables!! Beautiful work. It is like G&G day today with all the great posts. Well done on this set.